Q. 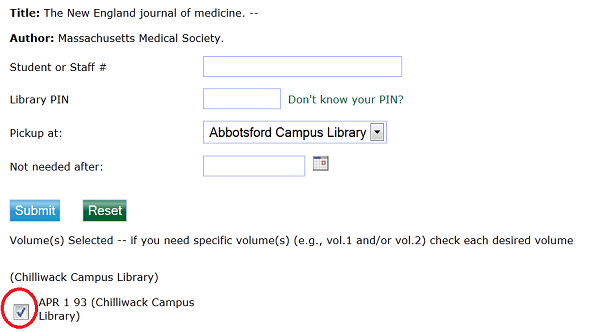 The item I want is at another UFV library. How do I get it? Click on "Place Hold" at the left side of the screen. This book is available in Abbotsford but I want to pick it up in Chilliwack. Enter your student number and 4-digit library PIN number (available at the Circulation Desk or click on the Don't know your library PIN link), as well as the campus where you want the item sent, e.g. Chilliwack. If you are transferring a journal, please indicate the specific issue you want. Delays will occur if you forget to do so because we cannot send the whole journal. See image below, it shows a request of the New England Journal of Medicine, April 1 issue,1993. A message will appear confirming that the hold is placed. Click on "OK" at the bottom of the message. We will deliver the transferred item to the library you requested at no cost. Each transfer takes at least one business day. You can return the library item to any campus libraries. See Interlibrary Loans if you are requesting materials from other libraries. Patrons who personally retrieve items from the shelf for checkout will be given priority over patrons who have placed a hold online. Loan periods may be shortened to one week in the event of multiple holds.